DOVE In its religious significance: symbol of the Holy Ghost. In a general sense: symbol of innocence, gentleness, conjugal affection and constancy. As a symbol of the Holy Ghost it originates with the incident attending Christ's baptism, when, according to St. Luke, 'It came to pass, that Jesus also being baptized, and praying, the heaven was opened, and the Holy Ghost descended in a bodily shape like a dove upon Him, and a voice came from heaven, which said, Thou art My beloved Son; in Thee I am well pleased.' (Luke 3.21-22, Matthew 3.16, Mark 1.10, John 1.32). The symbol was employed in early Christian times, in the catacombs and in mosaics, and it was occasionally represented with the nimbus. During the 11th century, a human figure with a book or scroll took its place; but in the 16th century, the older symbol was revived, and now the dove, as in early Christian times, is universally recognized as symbolizing the Holy Ghost. The dove as a symbol of innocence and gentleness is derived from the habits of the bird, which prompted Christ to advise His disciples, when sending them out to teach His gospel to be 'harmless as doves' (Matthew 10.16). And the peacefulness of such a gentle bird's life receives tribute from David when, in the midst of the pain and troubles of old age, he cries: 'Oh that I had wings like a dove! For then would I fly away, and be at rest.' (Psalms 55.6). DOVE A departed spirit, herald of heavenly news. Amorous delight, constancy, fruitfulness, gentleness, harmlessness, innocence, love, meekness, purity, sacrifice, sincerity, soul, tenderness, timidity, truth, winged aspiration. A good spirit, a loved one. Sexual emblem sacred to love and mother goddesses. As a fertility symbol of Adonis, Aphrodite, Astarte, Atargatis, Dionysis, Ishtar, Juno, Jupiter, Shulamite, Venus, Zeus, etc., often appears with the fish. In nature worship closely associated with rain clouds. Ancients sometimes substituted a dove for a human when offerings were being made to a deity. Dream significance: happy event. In heraldry loving constancy and peace. With an olive branch, harbinger of good news. A constellation in the Southern Sky, known as Columba and Noah's Dove. In China symbolic of good digestion, impartial filial duty, and long life. In Christian tradition the Holy Ghost. A symbol of the annunciation and baptism. Emblem of an apostle or saint divinely inspired. In Christian art identical with the winged disk of pagan art as a symbol of eternity, immortality, soul, spirit, sun. As a soul symbol issues from the mouth of dying martyrs. Sacred bird of ancient Egypt, Greece and Phoenicia. In Greece the equivalent of alpha-omega because the numerical value of the Greek word for dove 801, is the same as the numerical value of AO written backwards. In Hebrew tradition the dove was clean according to Mosaic law and sacrificed in rituals of expiation, especially by the poor. It was a symbol of gentleness, peace, and divine guidance, as in the legend of Noah. Among early Semites sacrificed to Jahveh as an atonement for impurity of childbirth; similar offerings were brought by Virgin Mary to the temple at Jerusalem after the birth of Christ. In Hebraic-Christian tradition, the dove compares with the Buddhist white swan. In Japan a good omen symbolizing tender sentiments. Emblem of the warrior deity Hachiman and of the Minemoto clan. One of the ten animals in the Moslem heaven. In Roman antiquity sacred to Bacchus, Jupiter, and Venus. Dove dung: The chick-pea, so called because of its appearance. A nourishment for those who cross the desert. Dove egg: In a medical superstition eaten as a smallpox preventive. Dove, gold & silver plumed: Treasures of purity and innocence. and lotus of Eastern religions. Dove and Nimbus: Christian Holy Ghost. life; sign which informed Noah he could safely leave the Ark. Dove, ring around its neck: Christian art: encircling sweetness of the Divine Word. Holy dove: In Christian art sometimes depicted as a rose. counsel, fear of God, knowledge, pity, strength, understanding, wisdom. Two wings of a dove: Love of God, love of man; active and meditative life. White dove: A health talisman; eaten as an antidote against infection. in conflict with fickle and rebellious passions. of the figures A & B below has employed the familiar symbol of the Dove. an idea fostered by the injunctions, "Be ye harmless as doves" (Matthew, X.16). And behold a dove flying heavenward [figure C]. and insinuating "voice of the turtle" was an echo on earth of the voice of God. the numerical value of the letters AO written backwards. and depict femininity and maternity; often two doves accompany the Mother Goddess. the waters of life. Sacred doves are associated with funerary cults. lasciviousness; also associated with the Earth Mother. of the spirit; a flock of doves is the faithful; a dove with an olive branch is peace, forgiveness and deliverance; as the dove of Noah's Ark brought back the olive branch of peace between God and man, and as it found no resting place outside the Ark, so the Christian finds no safety outside the Church. The dove with the palm branch is victory over death. A white dove is the saved soul, the purified soul as opposed to the black raven of sin. Doves in a vine are the faithful seeking refuge in Christ. Two doves together are conjugal affection and love. A dove on Joseph's staff depicts the husband of a pure virgin. The dove is the emblem of the Knights of the Grail and of SS Benedict, Gregory, Scolastica. In Nicolas Poussin's Annunciation (1657) at the National Gallery, London, the dove hovering over the Virgin's head simultaneously symbolizes the fecunding Spirit, the bird sacred to the Great Mother and Queen of Heaven, and Mary's submissive innocence. appears with the fruit of the tree and vases of the waters of life. Graeco-Roman: Love; renewal of life; an attribute of Zeus who was fed by doves. voluptuousness. A dove with a star is an emblem of Venus Mylitta. Hebrew: White doves, a purity, were offerings at the Temple for purification. innocence; meekness; guilelessness; incubation. Embodies the soul of the dead. or pillars surrounded by doves. bearing a sword, announces the end of a war. 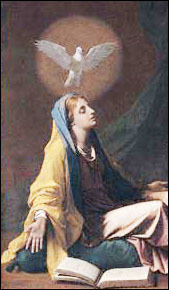 of the Trinity is sometimes depicted as a white dove. doves and snakes symbolizing the air and earth, were her attributes. the seventh day of the deluge. Thames & Hudson, London, 1978, pp. 54-55. An emblem of purity, aspiration, and gentleness, or the active principle animating the higher nature which descends into the lower nature in order to rise therefrom. the lower consciousness, so by the law of its nature it returned to the Self again. Aphrodite's totem, the bird of sexual passion, symbolically equivalent to the yoni. In India, too, the dove was paravata, the symbol of lust. 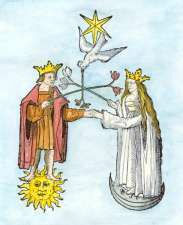 Joined to her consort the phallic serpent, the Dove-goddess stood for sexual union and "Life". Aphrodite as a bringer of death, or "peace", sometimes bore the name of Irene, Dove of Peace. Another of her death-goddess names was Epitymbria, "She of the Tombs". Romans called her Venus Columba, Venus-the-Dove. Her catacombs, mausoleums, and necropoli were known as columaria, "dovecotes". Thus the soul returning to the Goddess after death was again envisioned as a dove. From this image, Christians copied their belief that the souls of saints became white doves that flew out of their mouths at the moment of death. In the Catholic ceremony of canonization, white doves are released from cages at the crucial moment of the ritual. Christian iconography showed seven rays emanating from the dove of the Holy Ghost: an image that went back to some of the most primitive manifestations of the Goddess. In the Orient, the mystic seven were the Pleiades or "Seven Sisters", whose Greek name meant "a flock of doves". They were daughters or "rays" of Aphrodite under her title of Pleione, Queen of the Sea. Herodotus said seven holy women known as Doves founded the oracles of Dodona, Epirus, and Theban Amon. They were worshipped in the Middle East as Seven Sages or Seven Pillars of Wisdom: the seven woman-shaped pillars that had been upholding temples of the Goddess since the third millenium B.C. [Theodor Gaster, Myth, Legend and Custom in the Old Testament (1969) 804] Arabs still revere the Seven Sages, and some remember that they were women, or "doves". [Robert Briffault, The Mothers (1927), Vol. 1, 377] The Semitic word for "dove", ione, was a cognate on "yoni" and related to the Goddess Uni, who later became Iune, or Juno. The cult of the Doves used to incorporate primitive rites of castration and its modification, circumcision. India called the seven Sisters "razors" or "cutters" who judged and "critically" wounded men, the Krittikas, "Seven Mothers of the World," root of the Greek Kritikos, "judge". They killed and gave rebirth to gods who were Semiramis, legendary founder of Babylon, also meant "Dove" in the Syrian tongue. She was said to have castrated all her consorts. When circumcision replaced castration, the doves were involved in that too. Even Christian symbolism made the connection. The official symbol of the Festival of the Circumcision of Christ was a dove, holding in its beak a ring representing the Holy Prepuce. "Christ's fructifying blood" was linked with the similar emblem of Pentecost, which showed the descending dove on a background of blood red, officially described as a representation of the church fertilized by the blood of Christ and the martyrs. Dove: Doves represented the Great Goddess in Asia Minor, under several of her names such as Aphrodite and Astarte. They were raised in her temples, carved on her stelae, depicted on her jewels and coins. According to Homer, it was the Goddess's doves who brought Heavenly Father Zeus the ambrosia that kept him immortal. According to Herodotus, seven women called Doves founded the great oracles of Dodona and Thebes. The image of the dove reborn from the mouth of a dolphin (or delpos, "womb") seems to have represented the Goddess's Virgin aspect renewed out of the devouring Crone. Biblical writers masculinized the image as Jonah, who name means "Dove". The word ionah or ione may have descended from yoni, for the dove was a primary symbol of female sexuality. In India, the name of the Dove-goddess meant "lust". So vital was the dove symbol that patriarchal cults were constrained to absorb it, in many different ways. The holy Seven Sisters called Pleiades, or "Doves", were originally born from Pleione: Aphrodite as "Queen of the Sea". They were assimilated by the Christian image of the Holy Ghost, a dove with seven rays proceeding from it. Seven was the number of the Goddess Sophia, the original Gnostic conception of the female Holy Ghost who descended on Jesus at his baptism and on Mary at her impregnation. Sophia was blatantly masculanized early in the Christian era but her dove,and all doves, were always called "she" even in Christian writings. Christian souls of saints flying to heaven were represented by white doves in the canonization ceremony. Among the Slavs it is still claimed that the souls of the dead turn into doves. This corresponds with the ancient belief that the essence of every soul is female. The Gypsies claimed that only the souls of women can fly, as doves, in and out of the magic mountain where the dead dwell like the ba-soul of an Egyptian flying in and out of the burial mound. Men's souls are transformed into snakes, so they cannot fly. This vision of female and male soul, or Goddess and God, as dove and serpent, respectively, goes back to an ancient iconography. Even Jesus referred to it metaphorically: "Wise as serpents, and harmless as doves" (Matthew 10:16), though with a bias toward the male already perceptible. The idea that all souls were doves lived on in the Roman term for catacombs, Colmbaria, "dovecotes", sacred to the Goddess as Venus Columba, or "Holy Doves", who was much revered in France although she was only one of the church's saintly fictions. Both dove and olive branch originally meant "the peace of the Goddess". Dove (1) In the Near East, the dove was associated with the fertility goddess Ishtar; in Phoenicia, it was associated with the Astarte cult. In Greece, the dove was sacred to Aphrodite. * In India, and to some extent in ancient Germany as well, a dark dove was regarded as a bird of the spirit, yet also of death and misfortune. * Islam sees it as a sacred bird because it supposedly protected Mohammed during his flight. * In the Bible, Noah lets out three doves after the Flood, one of which returns with an olive branch; it is a sign of reconciliation with God and has since then been a symbol of simplicity and purity and, especially in Christian art, a symbol of the Holy Spirit; yet it can also occasionally be a symbol of a baptized Christian, of a martyr (with a laurel or a martyr's crown in its beak), or of the soul in a state of heavenly peace (for example, when it is perched on the tree of life or on a vessel bearing the water of life). * In conjunction with the four cardinal virtues, the dove symbolizes temperance. * A white dove pair is a popular love symbol. (2) "Eucharist dove" a tabernacle in the form of a dove that hangs over the altar and has a tray for the consecrated host; first mentioned in the 7th century. The peridexion tree grows in India. Doves gather in the tree because they like the sweet fruit, and because there they are safe from the dragon. The dragon hates the doves and would harm them if it could, but it fears the shadow of the peridexion tree and stays on the unshaded side of it. The doves that stay in the shadow are safe, but any who leave it are caught and eaten by the dragon. The illustration at left is from the British Library. The Aberdeen Bestiary gloss: " Take the tree as God, the shadow as his son... Take the fruit to be the wisdom of God, that is, the Holy Spirit." Salutations, O gently moaning Turtle-dove! You went out contented and returned with a sad heart to a prison as narrow as Jonah's. O you who wander here and there like a fish, can you languish in ill-will? Cut off the head of this fish so that you may preen yourself on the summit of the moon. Salutations, O Pigeon! Intone your notes so that I may scatter round you seven plates of pearls. Since the collar of faith encircles your neck it would not become you to be unfaithful. When you enter into the way of understanding, Khizr will bring you the water of life. "Aphrodite carried by her doves across the sky, reached the Laurentian coast." A number of different strands have contributed to the folklore and symbolism of the dove, and so various themes are involved. this is understandable when we consider that the folklore concerns more than one species and that different aspects of the bird's behavior have caught the attention of people in various communities. In most ancient writings the bird referred to is commonly the domestic Columa livia but species are not always clearly differentiated; when the allusion is to migratory species the turtle dove Turtur communis is concerned, or in Asia Minor Turtur risorius. The domestication of the dove (or pigeon) dates from remote times, as early Egyptian tomb paintings testify. there was a "pigeon post" in Babylon and according to Pausanias, the Greek traveller and geographer of the 2nd century AD, a winner at the Olympic Games sent news of his success to his father by homing pigeon. The Saracens also used pigeons during the Crusades to maintain communications. But in the Middle East as well as in Europe, dove cotes were built and the breeding birds were often exploited for food. Such dove cotes dating from the Middle Ages may still be seen in the English countryside. Although the flesh of doves has been found appetizing by many peoples and pigeon pie was a popular dish in England, there were inhibitions among the Semites against eating it; this was probably because of the birds' associations with divine beings. At Hierapolis in Syria, one of the chief centres of the worship of Atargatis, a deity similar to Astarte and Ishtar, the statue of the goddess was surmounted by a golden dove. The birds were regarded as so holy that a man who was impious enough to touch one was regarded as defiled for a whole day. The Greeks explained in a myth how the dove became associated with Aphrodite, the goddess of love. The goddess and her son Eros were playfully competing in picking flowers and as Aphrodite was winning because she had the help of a nymph named Peristera (Dove), so Eros turned the nymph into a dove and henceforth she remained under the protection of Aphrodite. A Greek writer mentions that as Adonis had been honored by Aphrodite, the Cyrians cast doves into a pyre to him. The mythology of the goddess, whose names Aphrodite Anadyomene signify Sea Foam, Rising from the Sea, and especially the story that she was born from an egg brooded by a dove and pushed ashore by a fish, suggest that her cult came from across the sea to Greece. Like a number of other birds with religious associations the dove came to be regarded as oracular. According to Virgil, two doves guilded Aeneas to the gloomy valley where the Golden Bough grew on a holm oak. There was a tradition at Dodona in Greece that the oracle was founded by a dove, and the oracle in the oasis of Siwa (Ammon) which Alexander the Great sought out was similarly reputed to have owed its origin to a dove. The Romans sacrificed doves to Venus, goddess of love, whom Ovid represented as riding in a dove-drawn chariot. 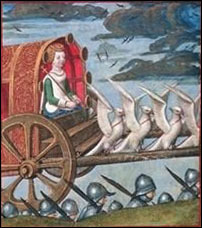 The miniature at left "Venus comes to the rescue in a chariot drawn by six white doves" (British Library) is from the Roman de la Rose by Guillaume de Lorris and Jean de Meun. Illustrated by Master of the Prayerbooks (circa 1495). The Roman worship of Venus was to a large extent derived from a Phoenician sanctuary (Eryx), where the dove was revered as the companions of Astarte. Thus European beliefs concerning doves were mainly derived from Asia. It may be that the association in the Middle East between doves and goddesses of fertility arose from the conspicuous courtship and prolific breeding of birds. The use of the dove as a symbol of peace, in which role it commonly appears today in cartoons is derived from the reference in Genesis (chapter 8), describing the return of the dove to the Ark. On being sent out the second time, the bird reappeared with an olive leaf in its beak 'so Noah knew that the waters had subsided from off the earth'. Thus the dove became associated with future prosperity and tranquillity, and hence with peace. The importance of the dove in Christian symbolism is derived from the account of the appearance of the bird at Christ's baptism (Matthew, chapter 3; Mark, chapter 1). From the time of the early Church to the present day it has been the symbol of the Holy Spirit, and from the 5th century the dove was shown in pictures of the Annunciation. It also appears in representations of the Creation as the spirit of God 'moving over the face of the waters'. The white dove has long been an emblem of purity and doves were offered in the Jewish rite of purification (Luke, chapter 2). In Malory's Morte d'Arthur, as the Holy Spirit appears to Lancelot, a dove carrying a tiny golden censer in its beak enters by the window, impressing the Knights of the Round Table with the purity of the castle of Pellas in which they are assembled. The incident is represented in Wagner's opera Parsifal. Doves feature in the biographies of Saints and Christian personalities down the centuries. In the 3rd century the election of Fabian as Pope was regarded as divinely indicated by a dove alighting on his head, and when Clovis was consecrated on Christmas Day, 496, a pure white dove was said to have brought a vial filled with chrism (anointing oil). Probably because of its association with the Virgin Mary, the dove became an emblem of innocence. For some North American Indians, though, it was an emblem of improvidence or incompetence. California and Great Basin tribes tell many proverbial fables about Dove's inability to build a sound nest, or to profit by the teaching of the thrush. The voices of doves have contributed to their folklore which, in America, seems often to have been transferred from the English cuckoo. In Georgia, a girl hearing the calls of the returning doves in spring performs a ritual derived from an English cuckoo ritual. After taking some steps she looks in her right shoe for a hair which will match the color of the hair of the man she will marry. Rual lore also says that the dove's call (like the cuckoo's) predicts rain. Unlike the cuckoo, a constant call of a dove is an omen of death. Doves have been widely associated with death and mourning, probably due to the soul-bird belief which is shared by many North American Indian tribes. An English folk belief suggest kepping a live pigeon or dove in the bedroom of a dying man, to prolong his life till the family gathers, apparently because the soul, with an affinity for the bird, might thus be made to linger. But in the United States the bird is also a health bringer: turtle doves nesting near a house keep off rheumatism, and a dead dove placed on the chest cures pneumonia.